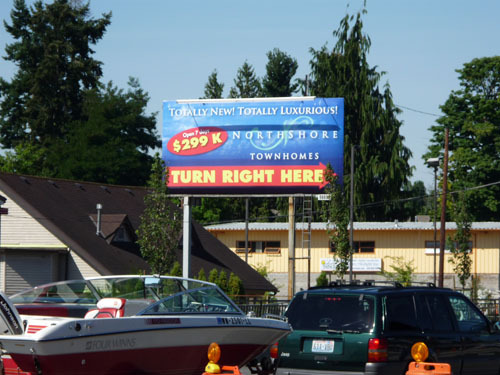 If you have arrived here looking for the official homepage of Northshore Townhomes in Kenmore, their website is no more. You may want to check out , instead. The following thread chronicles the amusing and sad tale of this out-of-place and horribly marketed townhome development in Kenmore. Enjoy. is an 86-unit townhome development that is nearing completion. totally cracked me up. "Just 12 miles from Bellevue Square" (oh and by the way just from which broadcasts their auctioneers on loudspeakers pointed right at you). And what's with the happy smiling couple super-obviously photoshopped in front of a seaplane? Have they actually been down to the waterfront here in Kenmore? It's pretty much entirely industrial all around the Kenmore Air harbor, all the way to Log Boom park (which is nice, but rather small). , asking $365k. The listings proudly proclaim that "the new Village By The Lake city center will be blocks away." Who knows when this so-called "village" will really be built. It's been Kenmore's pie-in-the-sky dream for years now, and all we have to show for it is an empty park & ride lot and some pretty drawings. I wonder how low they'll be able to drop the prices before they start to face losses. Looks like they . Napkin calculation... 86 units, average $325k... if they get current asking they'll take in around $28 million. What do you figure construction cost them? $5 million? $10 million? In any case, I really am interested to see if they manage to sucker people into these things at the current prices. Down the street are the newly remodeled , which are going between $189K and $239K. They are not having any luck selling them. When I was there they had sold one unit, and they've been for sale since the beginning of this year. Ouch. Have you seen the Verdeaux off of 160th, you have a great view of 405. My dad stopped in to see how sales were going and they had according to the sales office sold 6 out of 96 units after over 200 days. For the same price including $250 HOA you can buy a nice SFH with 2000 SQ ft and a large lot within a mile of these and not be looking at the freeway. Most people do not know of the old nike missle silo on the hill near there. I do not know alot about them but from what others have said is that they were for striking Russia or if a mass of war planes were on route they could detonate a nuke in the air. The missles often were equiped with 30 kiloton nuclear devices. Because a sunny beach with palm trees really says "Kenmore, Washington" (even more so than the smiling couple in front of the did). Also, they're advertising furnished units starting at $279k on billboards around here (though shows $299k and doesn't mention the furnished bit). The smallest units they have are 2 bed, 2.25 bath, 1,325 square feet. This pretty much totally screws the folks around the corner trying to sell their 2/2.25 units for and . The guy asking $345k for his , so at this point I have a hard time imagining how he's going to sell without taking a loss. I NEED a house in Kenmore. White sand beaches, palm trees, warm ocean waters. I hear everyone who lives (you have to buy a house to live BTW) there also gets a complimentary seaplane. Or at least a Sea-Doo. Unfortunately, all my real estate friends have been explaining to me eg nauseum that there are literally no homes available for purchase. Foot traffic is so strong right now, that literally nobody is trying to sell their home, and if anybody does accidentally put their home up for sale (Zillow's "Make Me Move" feature), the house sells before the owners even hit submit on an outrageous "Make Me Move" price. [sigh] I'll never have my dream of owning a condo in Kenmore, Washington. Those of you who are still young enough, learn from my failures. Don't end up like me! Totally inappropriate for the Kenmore market! Totally not selling!